North Coast | Beer Apprentice - Craft Beer News, Reviews, Interviews and Info. Hello again guys. 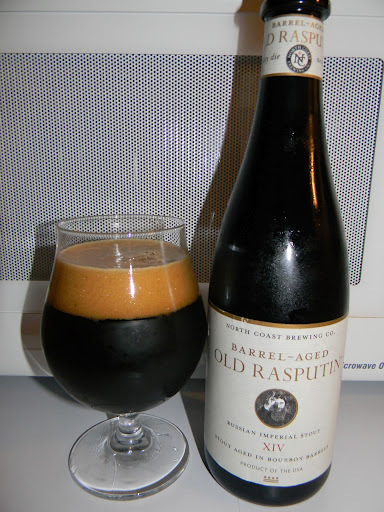 For today’s craft beer review I’m going to be trying the Barrel-Aged Old Rasputin XIV brewed by the North Coast Brewing Company located in Fort Bragg, California. Now, I love the “regular” Old Rasputin and if this thing is even half as good as that I’ll be satisfied. From the website, northcoastbrewing.com, we find this delectable description. Seems hard to believe that we’ve been making Old Rasputin for 10 years now, but that’s what’s happened. And, to celebrate the occasion, we’ve brewed a special small batch that’s been aged for 9 months in some 12 year-old bourbon barrels. It’s bottled in 500 ml bottles with a cork and wired finish and a special commemorative label —- and it’s amazing. The depth, intensity and complexity of the flavor profile make it a worthy tribute to this fine beer. The Barrel-Aged Old Rasputin XIV comes in a 16.9 oz. bottle and it has an ABV of 11.5%. The beer poured a gorgeous black color with absolutely no highlights showing through at all. The crown was very smooth, creamy, soft and of a dark tan shade. It was nearly the perfect size and it consisted of small, tightly compacted bubbles that held their shape for a good long while. The lacing was both thick and clingy. Once it settled it left a thin ring around the edge of the glass. I definitely noticed some alcohol feet as I swirled the liquid within the snifter too. Just an all around, beautiful looking beer. The nose revealed a divine waft of Bourbon Whiskey. It was very roasty, woody and oaky. Hints of both chocolate and vanilla added some sweetness while light leathery notes and tones of not quite cured tobacco added some earthy character. Additionally, I picked up on aromas of fresh coffee beans and even some dark fruits (raisins). This bouquet was very complex, harmonized and “smooth”. A “world class” aroma in my opinion. The taste revealed an excellent thrust of Bourbon Whiskey. It was easily noticed without ever becoming overly dominate or boozy. A good bit of bitterness stung the sides of the my tongue. At the same time, oaky and woody savors intermingled nicely with a bit of “char” and burnt toast. Further flavors of espresso, milk chocolate and vanilla bean totally hit the spot, while the dark fruit aspects seemed a tad more relaxed in the taste than they did in the aroma. The overall flavor was still superbly balanced and appealing though. Awesome to say the least. The mouthfeel was medium to mostly full bodied. It was quite smooth, creamy, chewy and dry. The carbonation was splendid and a wonderful radiant heat from the alcohol totally filled my belly. It really soothed itself out after the first few sips however. The palate was completely drenched with flavor after each and every swallow. What an elegant beer!!! It was excellent in all categories. There really isn’t a whole lot else to say except, pick this up if you get the chance. It is a bit expensive, but it is totally worth it in my opinion. Although it is best as a late night sipper, the drinkability was still really, really good. If you can appreciate Barrel-Aged brews, I don’t think that anyone would be disappointed in an evening with the Barrel-Aged Old Rasputin XIV by their side. I know I wasn’t. I’d love to obtain another bottle or two of this and cellar them for a while. I can only imagine that it would get better and more complex throughout the years. Like I mentioned before, I love the regular Old Rasputin, but I do think I’m going to have to give this beer the slightest nod as being a tad bit better. I love how the Bourbon melds perfectly with the other flavors, plus I’ve heard that the XIV was aged in bourbon barrels from the Heaven Hill Distillery located, literally, about 50 miles from my house right here in Kentucky!!! Be sure to leave a comment and let me know what you thought about this brew if you have tried it. I would love to hear your opinions. For today’s craft beer review I’m going to be trying another beer from the North Coast Brewing Company located in Fort Bragg, California called the North Coast Scrimshaw. As many of you know, North Coast Brewing generates a very good product regardless of style, so I’m expecting this beer to be more of the same. From the website, northcoastbrewing.com, I found this description. Let’s give this beer a try shall we? This beer comes in a 12 oz. bottle and at a lighter 4.4% ABV. It poured a hazy, yellow/gold, honey color. The head was very bright white and very small. Very little retention and very little lacing was left behind. I was a little disappointed with the look of this brew. Most North Coast beers look really nice in the glass, however this one was a little lackluster. Oh well, let’s just see how the other aspects hold up. The nose had touch of piny hops along with some earthy and “buttered” tones. Fruity aromas of lemon citrus as well as wheat and grain hints gave way to a yeasty smelling backbone. Not a whole lot going on here I didn’t think, although it had enough to keep me interested. The taste brought forth a commendable punch of bitterness. 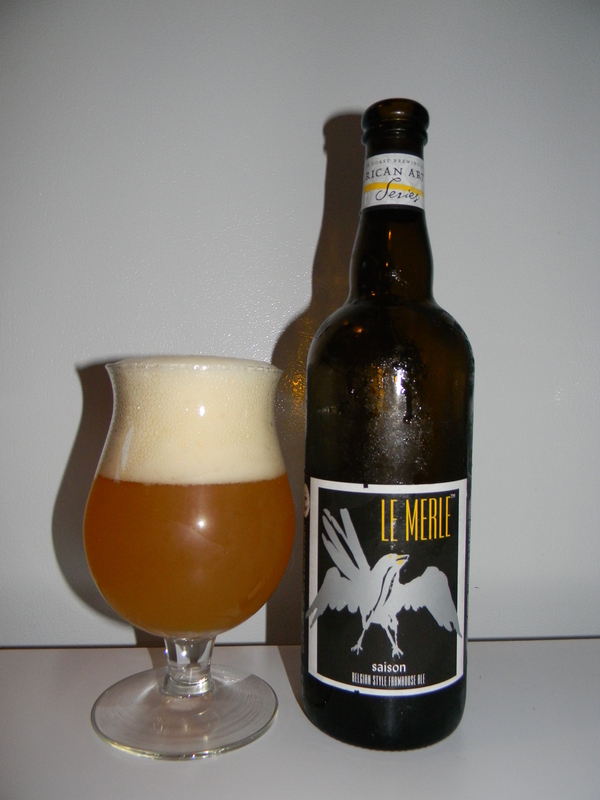 The lemon citrus started meager, but became more prevalent and sour as the beer warmed. Some hints of toasted bread and yeast helped pull some of the tartness off the lemon. Not bad. The mouthfeel was medium/light, crisp, clean, refreshing, smooth and mostly dry. The carbonation was so-so and the tongue and roof of the mouth were left with quite a bit of flavor to enjoy. This was a solid Pilsner I thought. It’s not a “traditional” Pilsner like one would find in Germany, but rather a little more closely associated with a Wheat beer I thought. It’s nothing too complicated, but it’s nothing dull or boring either. Just a pleasant drink that would fit nicely with Spring or Summer. 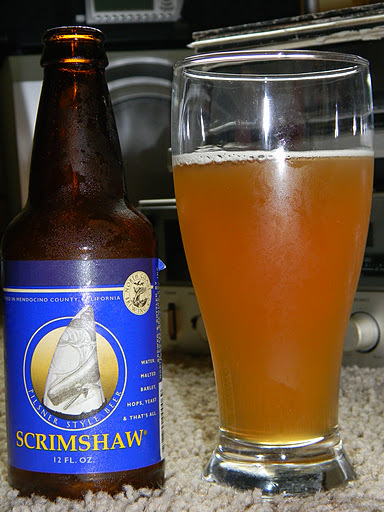 I, personally, don’t think the Scrimshaw is the best brew that North Coast produces, but it’s still worth a try if you happen to see it. It could very well be the beer you’ve been looking for. Be sure to let me know what you think of it if you happen to try it. Thanks for reading and commenting guys. It’s most appreciated. Until next time.